Trump posted a photo on Twitter Monday evening that's prompting some questions about his eating habits. The slogan isn't "utensil lickin' good" for a reason. While out on the campaign trail, Donald Trump posted a photo on Twitter Monday evening that's prompting questions about his eating habits. 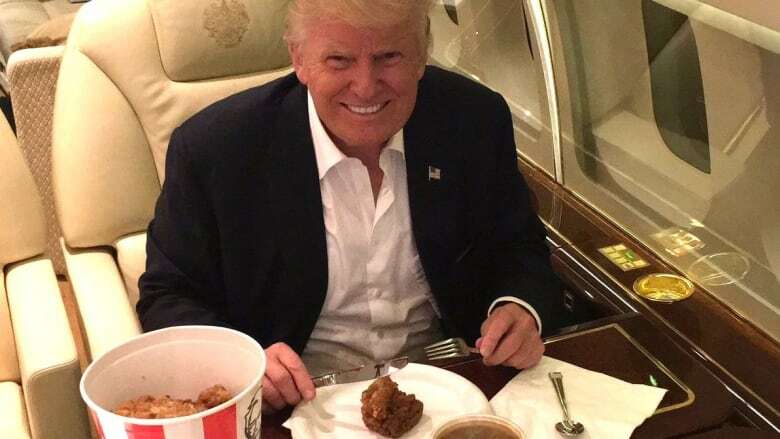 In the photo, Trump appears prepared to dig into a bucket of KFC fried chicken, mashed potatoes and gravy — but he won't be getting his hands on that chicken. He's using a knife and fork. Many users commented on how the photo was an obvious ploy to appear more relatable, but that it clearly backfired. Trump's supporter base is thought to be largely made up of working-class Americans, and the Republican nominee has been using every opportunity to try to convince the public that he's a "man of the people." Replies to Trump's tweet were swift and unmerciful. .<a href="https://twitter.com/realDonaldTrump">@realDonaldTrump</a> Certainly every American can relate to posing with uneaten peasant food before having a $750 in-flight meal from Per Se. .<a href="https://twitter.com/realDonaldTrump">@realDonaldTrump</a> You know, it would probably make you more relatable if you pretend-ate your KFC AT a KFC instead of your private jet. Some Twitter users suggested the photo was an attempt at courting the black vote. This isn't the first time Trump's been mocked for the way he eats. Back in May, he drew criticism for posting a photo of himself eating a Taco bowl during Cinco de Mayo. He and Sarah Palin irritated New Yorkers in 2011 when they pulled out cutlery while eating pizza together at Famous Famiglia in Times Square. Trump explained why he was using cutlery that day in a video posted to YouTube in 2011. "This way, you can take the top of the pizza off," Trump said in the video. "I like not to eat the crust so that we keep the weight down." Though he hasn't yet acknowledged the responses to the KFC photo, one person tweeted that it's only a matter of time before Trump puts his signature spin on the negative reaction.